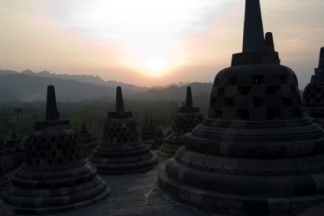 Borobudur, the greatest Buddhist temple in the World. And one the most famous attraction of Indonesia. With ingenious structure in the eighth century when high technology didn’t exist yet, and still the people in that time can built such a superb monument. It’s amazing. The name come possibly from the Sanskrit word “Vihara Buddha Uhr” which means the “Buddhist monastery on the hill”. Located about 40 km from Jogjakarta and between two twin volcanoes, Sundoro-Sumbing and Merbabu-Merapi, and two rivers, the Progo and the Elo. 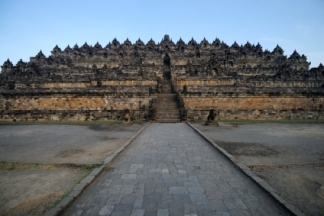 This great monument was built on a bedrock hill, and built in eighth century by the rulers of the Sailendra dynasty. 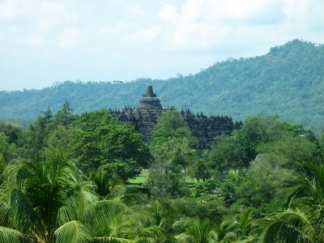 When the Buddhism was collapse in Java , this temple was abandoned soon after they finished it. The place was forgotten for a very long time, centuries buried under layers of volcanic ash. In 1815 the place was pretty cleared and they discovered the greatest imagination of the builders and technical skill was very high. This temple is a broad monument, built in the form of a massive symmetrical stupa, literally wrapped around the hill. The paintwork is long gone but it’s thought that the grey stone of this temple was at one time washed with white or golden yellow to catch the sun. Below the base of the monument are a series of relief representing a world dominated by passion and desire where the good are rewarded by reincarnation as some higher form of life and the evil are punished by a lowlier reincarnation. Starting at the main gateway at the eastern side go around the galleries of stupa clockwise, as one should around all Buddhist monuments. 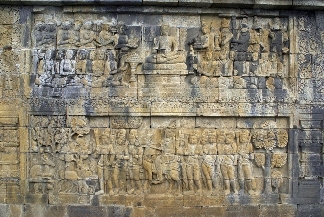 The reliefs on the wall of this temple tells many stories. On the slopes of the hill, there are also stairways connected to the low plain. The three circular terraces, which open to the sky and give a fine view across the valley, represent the world of nothingness, the Buddhist idea of heaven. Once a year take a ceremony place in this temple during the full moon in May or June, on Waisak, one of the national holiday in Indonesia. The ceremony is centered at the three Buddhist temple by walking from candi Mendut to candi Pawon and ending at Borobudur. If you want to visit this temple and you're planning to go on to the top, come as early as possible in the morning. It’s less crowded and the temperature is pretty comfortable before midday. Avoid weekends and holidays if you want fully appreciate the magnetism of this old temple.